Kristoffer Tejlgaard and Benny Jespen designed an amazing new geodesic bubble building that recently popped up at Copenhagen harbor. Called Dome of Visions, this mobile greenhouse studio boasts an innovative facade of overlapping CNC-cut polycarbonate "fish scales" and all kinds of flora, including a 100-year-old olive tree. 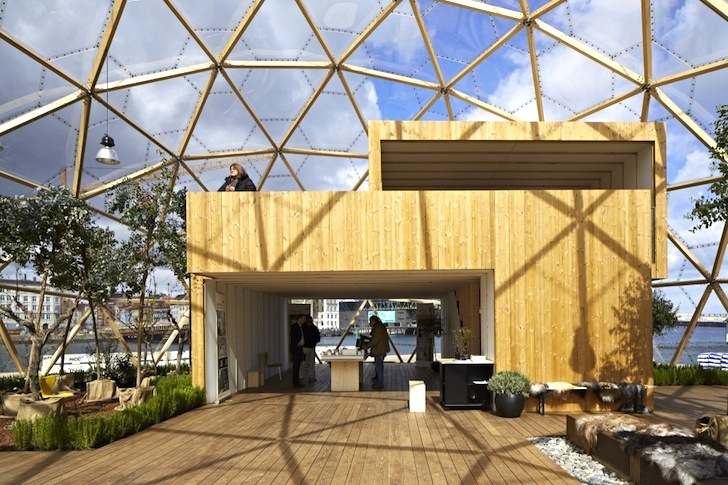 In addition to hosting artists, musicians, and other cultural events in Copenhagen and other cities, the dome will also provide a platform for serious discussion about the future of sustainable housing in a changing world. 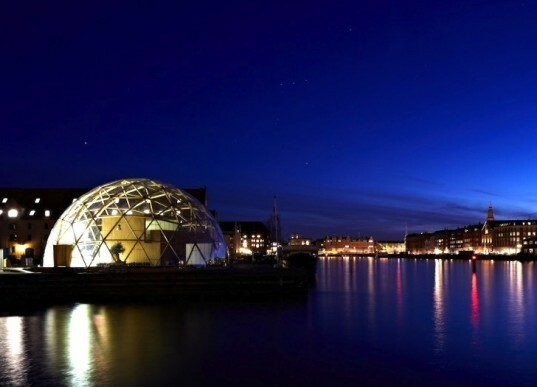 The mobile Dome of Visions greenhouse studio and temporary cultural center has set off on a two-year tour of Denmark and its first stop until May is at Copenhagen harbor. Squeezed between Noma restaurant and a warehouse designed by Nicolai Eigtred, the dome is a work in project that was designed to challenge the construction industry’s existing material usage and methods. Wrapped in overlapping scales of CNC-cut polycarbonate panels, the dome is incredibly weatherproof, yet breathable, and boasts greater insulation value than glass. When dismantled, these panels are 100 percent recyclable. A double story timber structure tucked inside has a conference room, garden terrace and a small studio on the ground floor. There are already some plants inside, including rosemary bushes and the olive tree, but eventually the design team hope to build a mini urban farm with raised vegetable beds and an irrigation system. Heated with both a mobile stove made with clay, horse dung and linseed oil bricks (that is ventilated through a horizontal chimney) and a liquid gas-based air to water heat pump, the dome is both an inspiring entertainment venue that generates visibility, as well as a serious scientific experiment. Throughout its tour of Denmark, its designers will test its energy usage and microclimate in order to gauge how well this design could stack up for future homes. Dome of Visions will be in Copenhagen until May, after which it will travel Aarhus, where it will be used to stage all sorts of summer events.